By Sean Charlesworth on Feb. 2, 2016 at 8 a.m. Compared to original Formlabs Form 1 printer, the Form 2 has a bigger print volume, a more powerful laser, a new resin cartridge system and new peel mechanism, among many other updates. 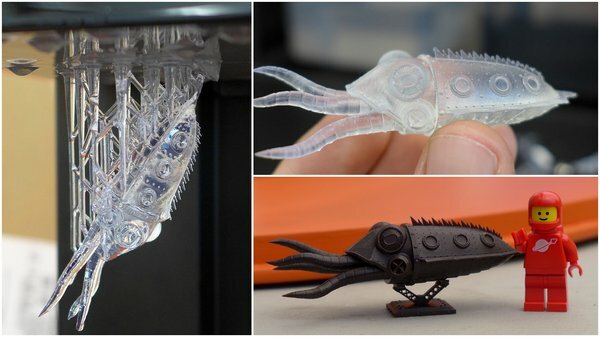 A few months ago, we previewed the new Formlabs Form 2 SLA resin 3D printer, which on paper looked to be an improvement on the Form 1+ printer in every way. 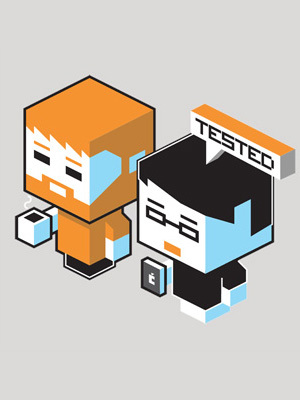 Since then, Formlabs supplied us with a review unit to evaluate those improvements in long-term testing. The upshot is that the Form 2 lives up to its promises--it's an amazing 3D printer. But you should read our extended review before you go out and buy one. We were very pleased with the Form 2 prints, most were done at 50-100 microns. The resolved detail was very impressive even at 100 micron, especially when compared to prints off of industrial 3D printing machines not meant for home-use. For most prints I can't see needing to go much below 50 microns as the quality was great. Prints that completed had very few flaws, too. Occasionally, very small details in our prints broke off during printing (ie: GIR's antenna tip, Nautilus tip). On many of the Form 1+ prints the side that printed nearest the platform tended to have some 'mushy' details, and I did not notice this on the Form 2. Noticed on some prints, we address this in the video. When we showed our friends prints from the Form 2 at the highest resolution, many couldn't even believe that they were made with a 3D printer. For some models, you have to strain to see the individual print layers at 50 microns. There were of course failures, and some of them were time-consuming and spectacular. The biggest issue we had were some prints that never adhered to the print bed from the start--not even the support raft. 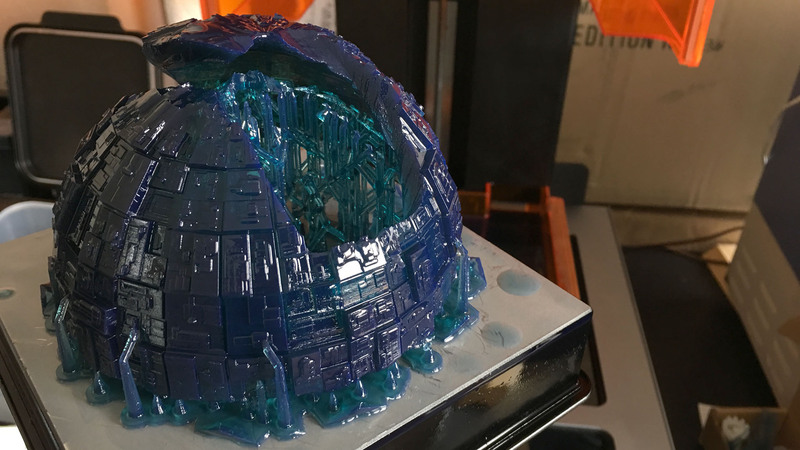 That meant that if we left the print going overnight, we wouldn't know it was a failure until checking in on it the next day--you have to keep an eye on the first half-hour of printing to see if it's started off properly. We never did determine why this was happening, but since the newest firmware update, the failure-to-start problem has all but gone away. 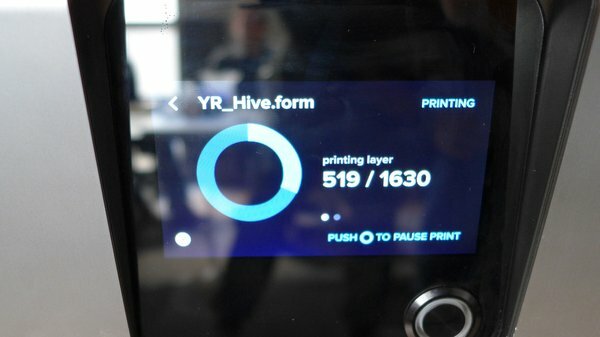 Formlabs also added the ability to tweak the platform-to-tray gap, a setting which would have aided successful print starts. We did have some mid-print failures which usually involved the unforeseen breaking off of the support structures. 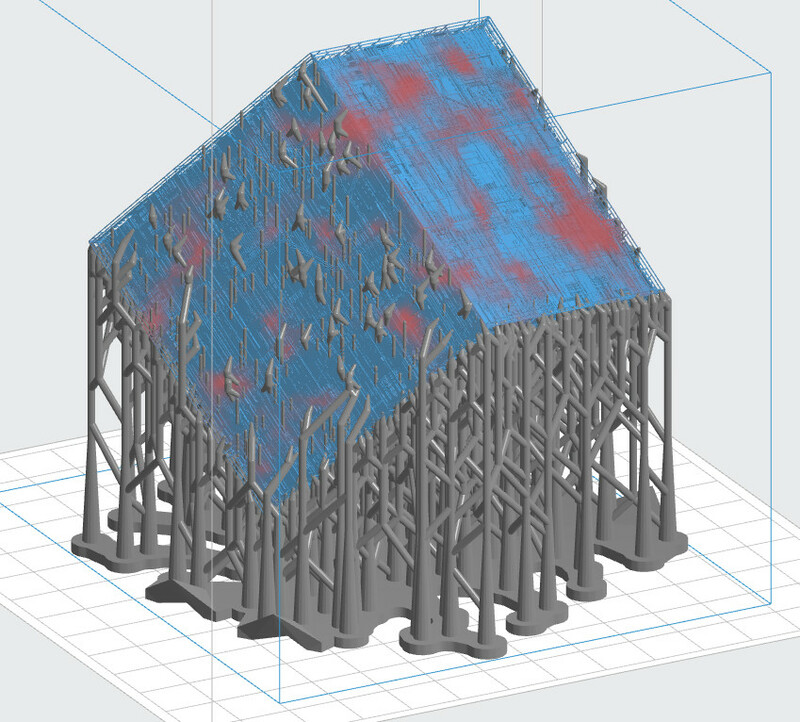 In the PreForm software, you can calibrate the density and placement of support structures to make sure the entire print object is held up to the platform (support placement is shown using a neat heat-map visualization). Our mid-print problems may have been due to my tweaking the density and size of the structures against the recommended settings. Some prints had issues on a particular layer, but managed to recover, although marring the finished print. 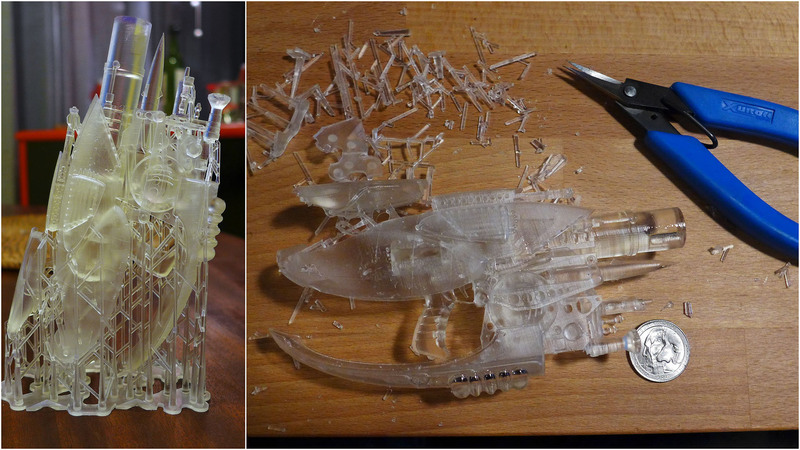 One of the more complex models we attempted to print was the Zorg ZF-1 rifle from The Fifth Element. The first Zorg ZF-1 we attempted was actually a perfect print but was damaged during support removal. This is a particular case where no fault lay with the printer, but with the model itself, the scale and the support placement. The final print is beautiful, but due to the nature of the model, there are many inaccessible places where support were needed. Removing those supports was impossible or damaged the model in the process. The model was also not intended for 3D printing as some parts were not attached to others, were too thin, hollow, or not well supported. 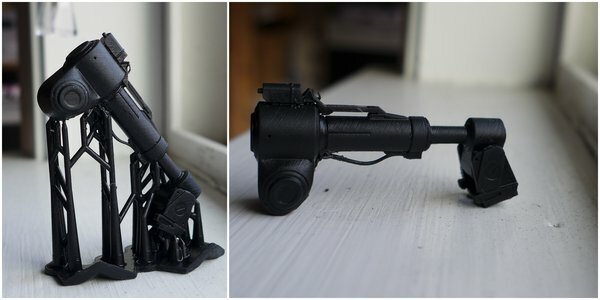 Now let's take a look at each aspect of the Form 2 in detail. Resolution - The layer (z) resolution changed somewhat from the Form 1+ ( 25 - 200 microns) to 25-100 microns (.025mm - .1mm) and the feature resolution (how small a detail it can accurately reproduce) has been improved from 300 to 200 microns, or about twice the width of an average human hair. We were able to reproduce some truly minute details, such as the rivets and propellers on my Scuttlefish. I don't feel that the loss of the coarser 200 micron option is an issue as the printer works faster with the updated laser and those purchasing this machine are looking for finer detail anyway. It's also worth noting that a direct comparison of the 100 micron layer to an FDM print at the same resolution will show different results. 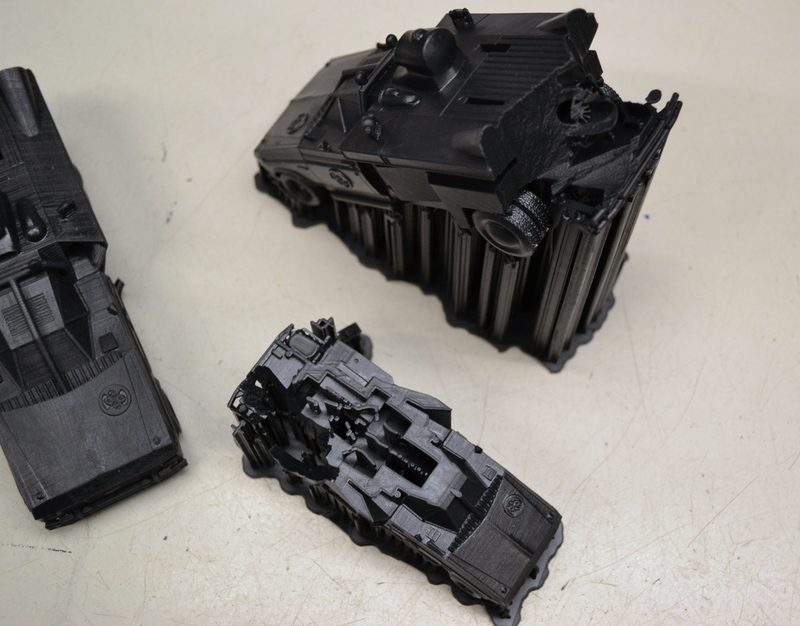 The Form 2 SLA print will resolve finer and cleaner detail at the same layer resolution vs. the FDM print. Currently, resolution is also material dependent with only Grey, Black and Castable resin capable of the highest resolution of 25 microns. All materials are capable of 50 microns which I found to be more than enough for most prints. Laser - The laser is 50% more powerful, allowing for faster prints and the finer detail resolution. Even more exciting is a completely sealed optics chamber. This was one of my major concerns with the Form 1+ as dirt and resin could easily fall inside onto the optics - it's great to see this feature. Out of all the updates, I was most pleased with this as the open optics chamber of the Form 1+ was a constant problem for me. With a background in film and video repair, I have the proper tools and knowledge to clean precision optics and the mirrors on the Form 1+ needed constant cleaning which I found challenging. A drip of resin on the sealed chamber, while still an effort to completely clean up, was far easier to deal with than cleaning the internal optics. I didn't keep a log of print times for the Form 1+, but the Form 2 definitely finished faster with the new laser setup. Print Trays - The trays have the same optically clear, soft, silicone bottom as the Form 1+, but have been completely redesigned otherwise. Aside from the obvious size difference, the plastic is stronger (I had problems with the Form 1+ trays cracking in the corner), they are easier to install and are now heated. This is to address concerns with the resin being too cold and viscous to print properly (for makers working in the garage). The heating mechanism is mounted in the machine, under the tray. 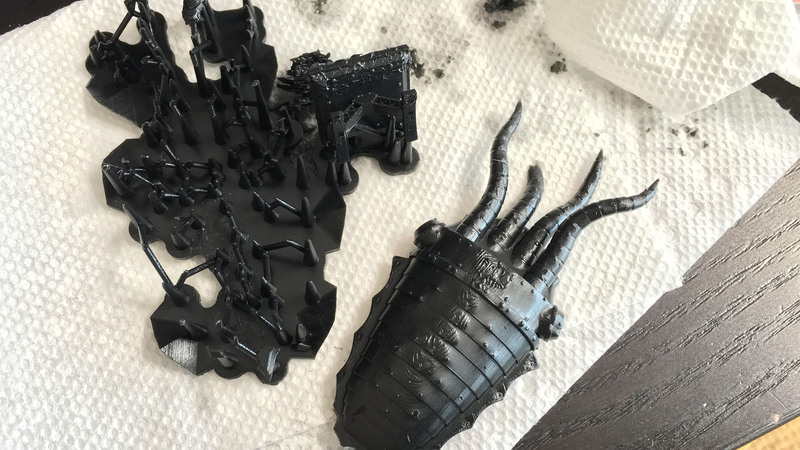 I had a two instances where I received a heating error from the printer, but after talking to Formlabs, it seems that this was due to the resin not reaching target temperature in the time expected. This can happen if the resin is particularly cold--and it was chilly in the office that day. Formlabs said they will be addressing this via a firmware update. Trays are considered expendables and you should still have a dedicated tray for each material. They will need replaced after so many prints (Formlabs recommends after 2 cartridges of resin). After so many prints, the silicon in the tray will start to haze, obscuring the laser and preventing proper resin curing. We had one tray start to haze after using about ¾ of a single resin cartridge, which was disappointing. I spoke to Formlabs about this and there can be a few contributing factors. With ultra-fine resolution such as 25 microns, the laser will be 'drawing' over the same area as much as four times more to produce the same model which will obviously degrade the silicon faster. 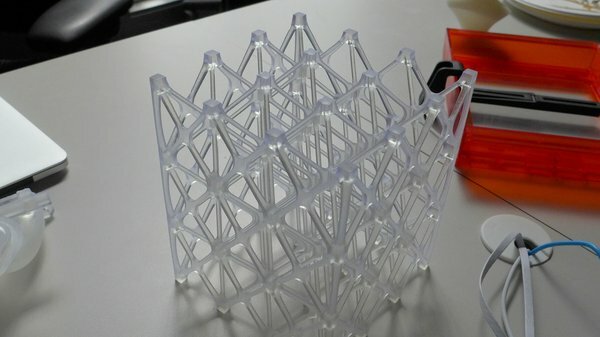 Another tip is to make sure to move each print to a different area of the tray to evenly distribute 'wear'--Formlabs hopes to implement a software tracking system to help with this. They also indicated that the Form 2 is more tolerant of hazing and more likely to still print alright due to the new laser and this seems to be true from my experience. Ultimately, I would really like to see a trade-in program for trays or a way to swap out just the optical silicone portion, as it feels really wasteful throwing out the entire tray and wiper. Peel Mechanism - The peel mechanism has been completely updated from the From 1+. 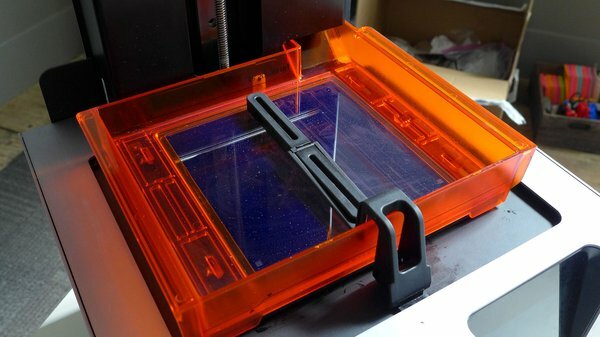 Rather than rocking down to peel each layer, the Form 2 tray slides from side to side. With the Form 1+, large surface areas were hard to print, as the peeling process would often fail (see Winterfell in Form 1+ review). The new method allows for much larger surface areas to be printed successfully. Even more exciting is the addition of a wiping mechanism that cleans the bottom of the tank after each layer. This reduces little boogers and blemishes but can also save prints from failing. A common way for prints to fail is when a portion of the layer doesn't peel and sticks to the bottom of the tank. Once that happens, the stuck piece will prevent the laser from making any new layers in that area, typically wrecking the whole print. With the wiper, that failed portion should get scraped off the bottom allowing the laser to continue. So rather than a failed print, you may only have a small blemish. In practice, I found the new mechanism worked very well. The wiper kept the resin stirred up which was good for black and gray which may need shaken before use. We did have some prints that had a stuck layer but recovered due to the wiper. I had quite a few failures on the Form 1+ where the entire print failed due to a stuck layer. Most failures we had on the Form 2 seemed to be from the model breaking loose from the support structure or platform (more on that later). A new wiper is included with every resin tray. The wiper does make the Form 2 a little noisier than its predecessors but it's still far quieter than any FDM machine I have used. Resin - New to the Form 2 are resin cartridges - simply drop it in the back and it feeds into the tank. This cuts down on the mess, but even better - no refilling tank part way through a print! The cartridges are chipped which instantly made me frown, but no DRM is involved. The chips communicate what the cartridges are filled with and tracks how much material is used so it can warn user if there's not enough for a given print. Tanks are refillable, so if you have bottles from the Form 1+ you should be able to use them in the cartridge. There is also the option to fill the tray manually, like the Form 1+. The cartridge system made things much easier and less messy and it was a relief to not have to constantly worry about filling the print tray. I did have an instance where I received a error and the tray would not fill up. It turned out I did not have the tray fully pushed in and the printer could not correctly read the fill level - reseating the tray fixed it. 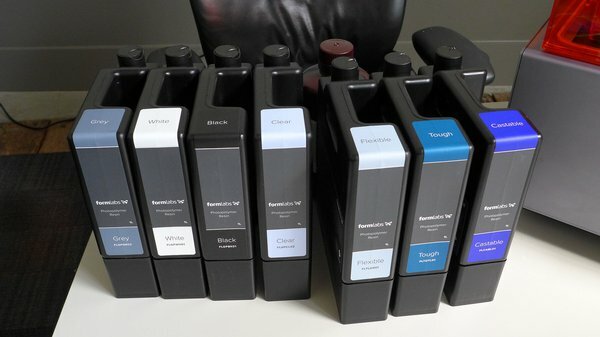 Since my last review, Formlabs has introduced new materials and updated versions of others. 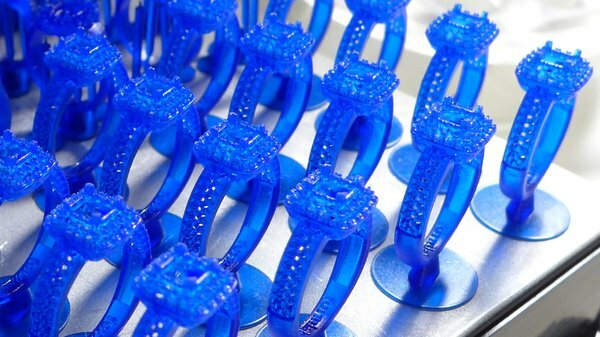 The castable material can be used in investment casting where the print material is burned out and replaced by metal - it's capable of very fine detail and suitable for jewelry. Flexible is clear and relatively stiff (think shoe sole) and is a nice addition. I am most excited about Tough which is more ABS-like vs. the standard resins which I would describe as more acrylic-like. I printed some items with tough and it has a nice give to it while remaining strong. It didn't work well for smalle spindly parts such as my Hellboy crankshaft (to be fair, the crankshaft doesn't work well in most 3D printed materials), but for larger mechanical items it was very nice. Interface - Rather than the one-button-does-all of the Form 1+, the Form 2 has a large, full color touch screen. There is now 4GB of on-board storage for print files and the machine is Wi-Fi and ethernet enabled. 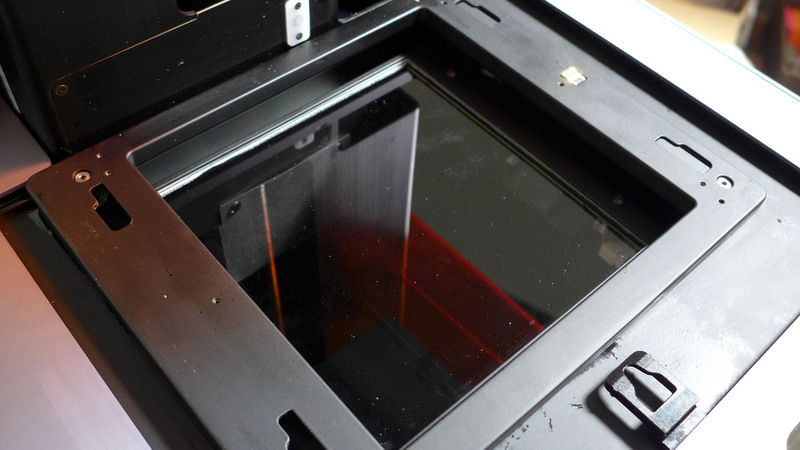 The touchscreen is a welcome addition and made accessing the on-board storage and starting prints easy. In addition, you can access machine settings and see a monitor of resin loaded, temperature, print times, print layer, etc. Onboard prints are locked into whatever resolution and material was assigned in the PreForm software. The printer will inform you if the wrong material is loaded and the model will need reprocessed in the software if a different material or resolution is desired. Models can take a while to load from computer to printer via Wi-Fi , but didn't seem much different than loading directly via USB. Many of our models were quite complex so this could have been due to that. Another nice addition is leveling feet with a handy adjustment tool and onscreen level. In my old fun-house-floor apartment, I had to put shims under the Form 1+ to keep the resin level, so this is a really nice touch. I did have some issues with the onscreen level being twitchy or prints pausing due to the machine being 'out of level' when it was not. This seems to have resolved itself with the newest firmware. Formlabs has also added Dashboard, an online interface. Right now it's underutilized as it can only tell you when a print starts and stops via text or email and keeps a running list of finished prints with details such as material, resolution and print time. I would like to see the option to at least upload a model via Dashboard. It would also be nice to stop the printer, although starting a remote print might be risky. You can keep track of whether a print was a success or failure but I would also like to see a way to add you own comments on the print. Software - The PreForm software is still easy to use and relatively fast. The biggest improvement since the Form 1+ review is the support generation. They are much finer, use less material and are much easier to remove. Auto-orient will attempt to position the model for the greatest chance of success. Since the support structure will leave some marks on the print, I usually found myself orienting models manually. This allowed me to place the supports on the least noticeable areas of a print. I have realized that there is an art to figuring out the best position for a model and generating the proper supports for it. I think most of my failed prints resulted from me messing with the suggested orientation of model and supports. PreForm will warn you of this by using a heat map style representation of where a model may have issues due to lack of support. Sometimes this gave a false positive and sometimes seemingly needlessly heavy supports were added to areas. I would encourage Form 2 users to get comfortable with modding supports and orientation which will come with time and getting to know how the printer works. I ran into a few instances where arranging multiple parts on the print bed resulted in the parts intersecting each other. 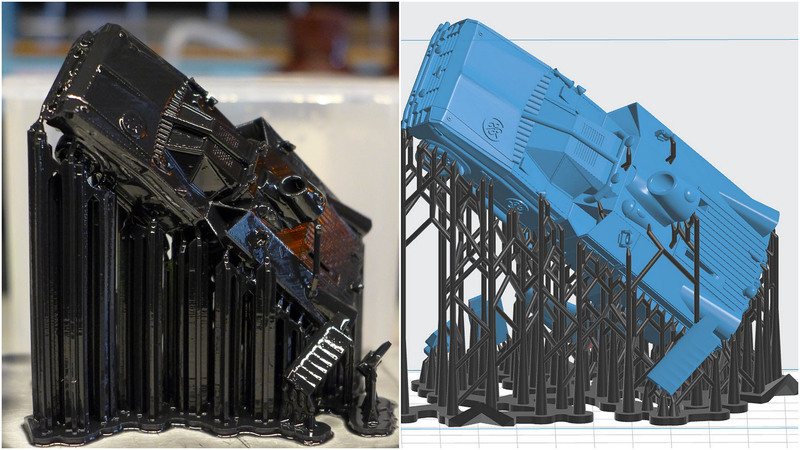 The recommended workflow from Formlabs is to Auto-orient which independently moves each model for optimal printing, then Generate Supports for that given orientation, then Auto Layout which will fit everything on the bed. Sometimes you will not be able to fit all models based on orientation and supports generated. Cleaning and Post Processing - Once printing is finished, you need to remove any excess resin with an alcohol bath and even the cleaning station got an upgrade. 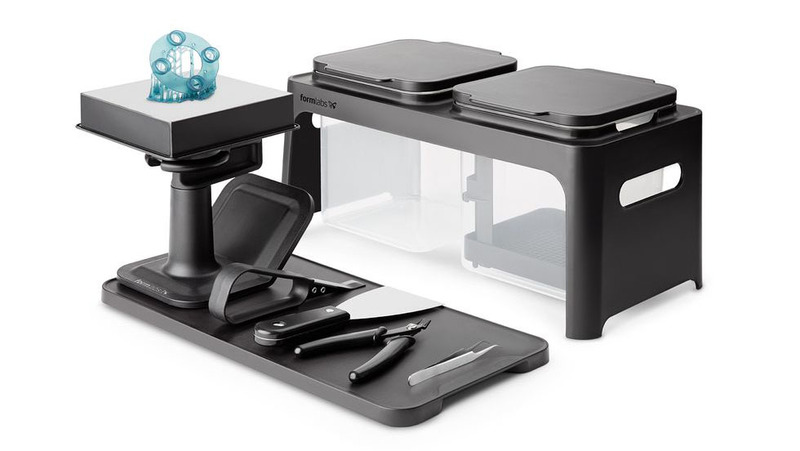 Looking to make things easier and reduce mess, it's been completely redesigned with easy to open containers (one-handed), a work surface to remove prints on and a nifty handle that attaches to the print platform for a better grip. A great redesign that takes up less room and helps contain the mess that these prints can make. The alcohol containers now have a holder to prevent tip overs, allows one handed opening and closing and catches drips. The new dunking basket is much sturdier and the new platform handle is great for prying prints off. The tanks still come with snap on lids if you need a secure seal. 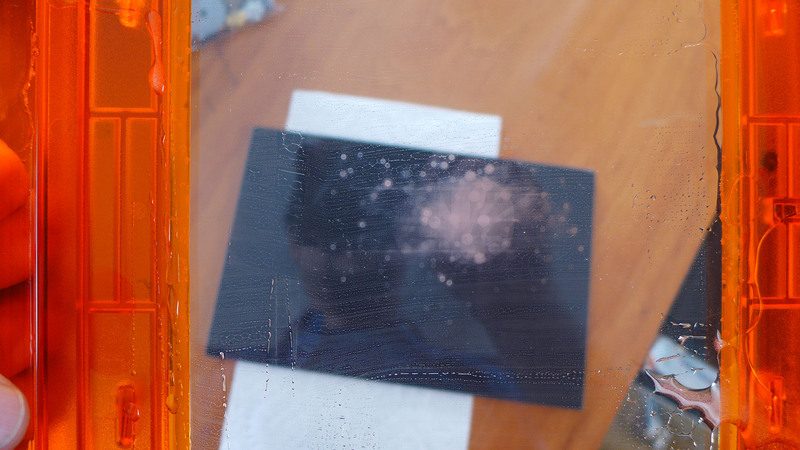 Removing prints from the aluminum print platform can be challenging as they really bond to it. The support structures generate with helpful little niches to get the scraper into which helps. Some of our large prints with big bases were really tough to remove - go slow and work the scraper under as many helper niches as possible. Even with the improved supports, removing them from your print can be a pain, but that's true for any 3D print. Even with the improved supports, removing them from your print can be a pain, but that's true for any 3D print. 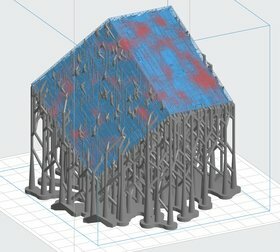 The density and point size of the structures can be tweaked in the software to reduce marring, but you then run the risk of not having strong enough supports to survive the peeling process or hold a heavy model to the print platform. I think some of our failed prints were due to my meddling with support settings. The included flush cutters help with support removal - I upgraded to Xuron Sprue Cutters and Photo Etch Scissors along with an x-acto for most of my cleanup. Even then there will be some marks left which can be cleaned up with fine sandpaper and mineral oil. Since prints are curved via UV, they will remain UV-reactant which means you want to avoid placing them in the sun or other sources of UV light or they may discolor and become brittle. However, you will notice that newly finished prints will have a bit of a soft, tacky finish, even after cleaning. Typically resin prints will get a final bake in a 'UV oven' to fully set the resin so it's ready for sanding and painting. 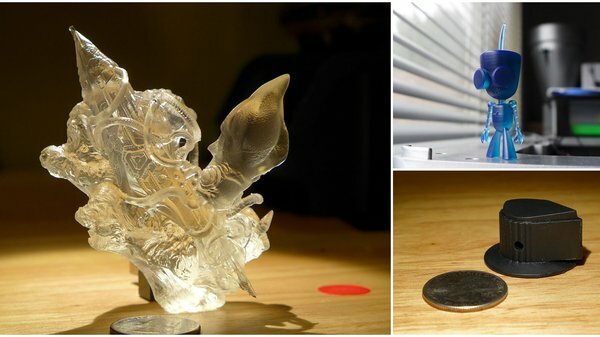 Formlabs has detailed a DIY UV oven using a cheap UV nail polish curing unit. I would highly recommend a UV setup as new prints don't take well to immediate sanding as they are still slightly tacky. Finishing and painting is the same as most plastic or resin models. Formlabs has been posting some nice finishing guides. We have really enjoyed our time with the Form 2 and have produced some beautiful prints. I was really pleased to see all of my complaints about the Form 1+ addressed which makes the Form 2 a big step forward. Most of the bumps we experienced seem to be getting worked out via firmware updates, will keep you posted on that. This is not the printer for everyone and you should really look at what fits your needs. While it's not a cheap machine, I think it's reasonably priced for the quality it produces and would pay for itself in the right hands. At $3499 the Form 2 is only slightly more expensive than the Form 1+ was ($3299) and a $400-$600 discount is being offered to existing owner through the end of February. 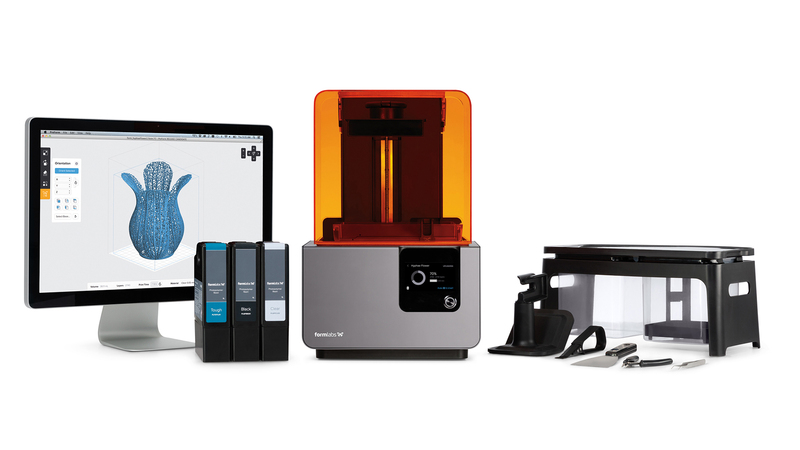 With the release of the Form 2, the Form 1+ is priced at $2799. The resin ($149-$299) and trays ($59) remain at the same price as before. Watch Norm and I continue the discussion and demonstrate the Form 2 in the video.